Acoustics professionals with more than 50 years of combined expertise formed Phoenix Noise & Vibration in 2004 to serve the building community of the Mid-Atlantic and beyond. Led by Scott Harvey – a seasoned PE certified by the Institute of Noise Control Engineers – our team has solved tough challenges for more than 900 projects across the full spectrum of building types. We work closely with our clients to help them meet building requirements and eliminate unwanted noise and vibration. As evidenced in our case studies, we fit our solutions to each project’s budget, regulatory demands and technical specifications. Regardless of scope, our clients come first. We demonstrate this every day in our efficient project management, responsive communication and professional reporting standards. Phoenix Noise & Vibration does not sell acoustic products or represent their manufacturers. We are strictly an acoustical consulting and engineering firm, so you can count on objective recommendations based solely on your needs. 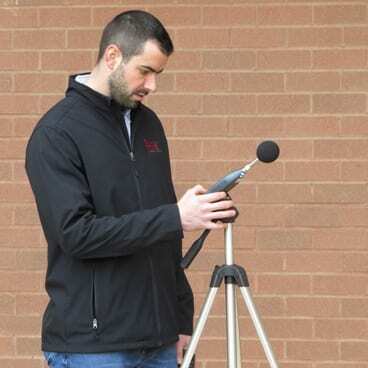 Whether it’s analyzing site conditions, working acoustic solutions into a new design or resolving issues in a completed building, we bring specialized, focused expertise to your project team. Our noise mapping and site surveys benefit from industry-leading software that includes DataKustik’s CadnaA and proprietary analytic tools. Once we’ve quantified the challenge, we apply our design experience developed during projects that include research facilities, mixed-use redevelopment, high-rise residential towers and single-family neighborhoods. We frequently help property owners achieve noise reduction or draft noise mitigation plans to meet regulatory requirements. At the same time, we work with developers and architects to stop potential noise complaints before they happen. In every instance, we deliver more than just solutions to clients’ challenges. We offer a commitment to professional accuracy, integrity and customer service.